Fruit trees are too tall? Hedge and thorny bushes are hard to reach? Your pruner is too heavy to prune your plant effectively? Don't worry. Finether telescopic pole pruner can solve your problems perfectly. 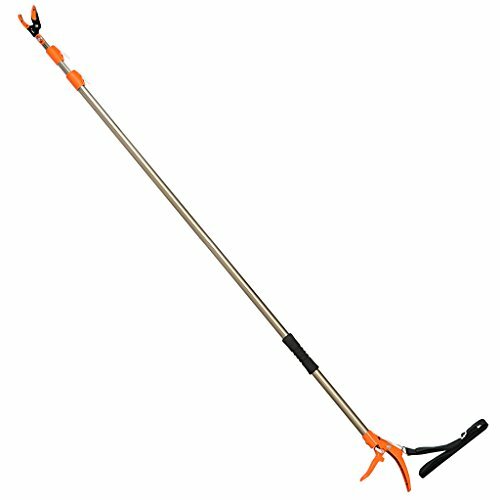 This telescopic pole pruner can extend to your desired height with its telescoping pole. It is made of aluminum, only weighing 2.95 lbs (1.34 kg), super easy to carry and operate. Features cut & hold feature, it allows you to hold the pruned limbs while cutting off until you release and put them into a trash can or your gardening bucket, making your pruning or harvesting chores easier. You don't have to bend to pick up all the dead branches or fruits. Metal pull chord with an ergonomic spring-loaded handle allows you one-handed operation and prolong the life of this unit. This is a well made conveniently sized tool that has it's place in your tool collection for bush/ tree maintenance. Never miss it.